Our first Fall Festival, entitled "An Autumn Afternoon in Ned Wolf Park" took place on October 19th, 2013. And there were some fun activities for all who arrived. The day was seasonably cool, with a mix of sun and clouds, and many friends and neighbors streamed through the park from 1pm to 4 pm. We sampled lots of seasonal treats like apples and cider from Weavers Way Co-op, donuts from Trolley Car diner and some homemade goodies from neighbors including popcorn and a variety of cookies. Besides celebrating the fall season, the Friends of Ned Wolf Park wanted to celebrate having received two honors from the Pennsylvania Horticultural Society: 1st Prize Small Community Park in the City Gardens Contest as well as a Community Greening award, given to places which "raise the horticultural bar" across the state of Pennsylvania. 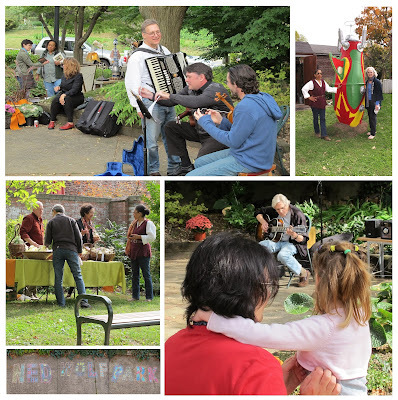 As some folks browse through the small collages made by Eric Sternfels, alongside his tabletop lighting sculptures, the park was entertained by the Quarter to Four Trio: Dave Graves on accordion, Daniel Boemcke on guitar, and Stephen Kadlecek on violin. Syd Carpenter and Kate Hochner flank the whimsical sculpture that landed in Ned Wolf Park on the morning of the event. This piece by artist Curtis Coyote is part of a series entitled "Things I Wish Would Happen in My Backyard", and having it happen in Ned Wolf Park may be the next best thing for kids of all ages in Mt. Airy. Another musical performance clearly enjoyed by the crowd was singer/guitarist Richard Drueding who serenaded the assembled visitors to kick off the day's activities. The sidewalk along W. Ellet Street now has some subtly painted outlines of letters spelling out "NED WOLF PARK", an irresistible opportunity to do some coloring in with sidewalk chalk. Although the rain has washed some of that exuberance away, we hope our neighborhood's children continue to bring chalk to draw in or out of these lines. Here's the Ned Wolf Park Design Committee setting up the baskets of spring flowering bulbs that were for sale at the event: Eric Sternfels, Janet Novak, Yvonne Haskins, and Syd Carpenter. Our committee helps steer the aesthetic character of the park, especially focused on plantings in the gardens beds. Three of the eight types of bulbs for sale were added into the park to add some pops of color next spring.....look for a future blogpost featuring them. Let us know if you'd like to join this committee and we'll send you an email when next we meet. The Autumn Afternoon event drew not only our Mt. Airy neighbors but some visitors from outside our zip code. Here are Jay Flaherty, Diane Newbury, and Lucretia Robbins - all great gardeners - who were impressed with the recently improved sunny garden beds with perennials still producing abundant flowers and grasses displaying showy seed heads. The events were not all spectator sports. Between live music performances, a bit of recorded folk dancing music and one helpful and welcoming instructor brought folks onto the Terrace for a bit a fun. It's nice to see neighbors leaning on one another, isn't it? Special thanks to Mark Klempner who took all these photos and captured the fun-filled day!! !